I LOVE Hyland's, and this kit includes everything you need to be prepared for anything from teething to colds! 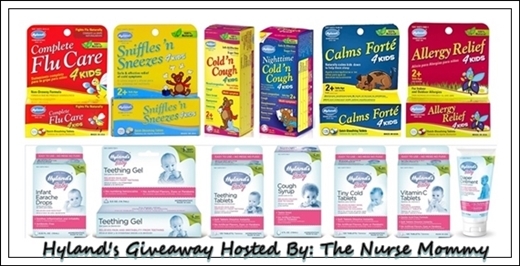 Welcome Mamas and Mamas-to-be to the Hyland's "Mommy Medicine Starter Kit" Giveaway! When I had my daughter, I wanted to stay as naturally based as I could in regards to medicine. We use mainstream medications when it's warranted, but I usually go for something natural and homeopathic first. Babies get sick. It is going to happen. The question is, are we prepared when it happens, or are we rushing out to the drugstore at 3am trying to find something that's safe to give our babies? I know I'm one mama that needs to be prepared in the event of an emergency. It just gives me peace of mind to know things are in place and in the event I need something, I have it on hand. Are you prepared? If not, Hyland's is here to help. 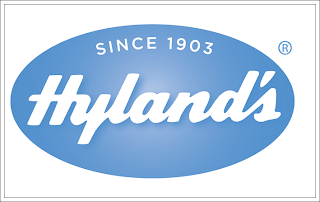 Hyland's develops homeopathic formulas with the highest quality natural ingredients following the strictest standards for preparation. With a century of commitment to homeopathy, Hyland's tradition of excellence consistently provides quality and integrity in every homeopathic product. The active ingredients in Hyland’s homeopathic medicines work by stimulating the most effective healing force known - the body's own natural defenses. We're so excited to be sharing this giveaway with you! Hyland's is going to be giving one reader a "Mommy Medicine Starter Kit" with everything you'll need, from teething, to cough/colds, to diaper rash, they've got your babies covered! They're even throwing in their 4Kids line of products for the kiddos over two! About the Giveaway: One winner will receive a Mommy Medicine Starter Kit with an ARV $115. This giveaway runs from 5/1-5/21 at midnight and is open to US residents ages 18+. Winner has 48 hours to reply to email or another winner will be selected. ALL ENTRIES ARE VERIFIED. I love the teething tablets! Those things work wonders for my little one! teething tablets have been the best!